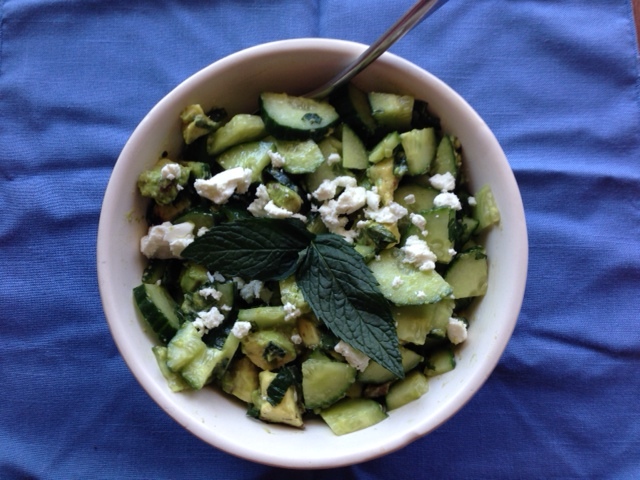 For a refreshing summer salad, combine cucumber, avocado, and mint with a little olive oil and lime juice. We’ve been holding our church services at Spontaneous Celebrations, a community center in Jamaica Plain. I was standing outside after the service in the bright sunshine with Rebecca and Jenny when I noticed there were huge bunches of mint growing between the sidewalk and the bottom of the stairs. Mint can take over a garden like an invasive weed, so I had no qualms about helping myself to a bunch of mint. It’s wonderful to not only have a mint in a vase to perfume the air but also to keep it handy to chop into salads, or add to a glass of refreshing ice water or lemonade. With August’s arrival comes the abundance of fresh tomatoes. A slow-simmered dish like ratatouille is a delicious use of right-off-the-vine tomatoes and should be part of your summer’s repertoire. 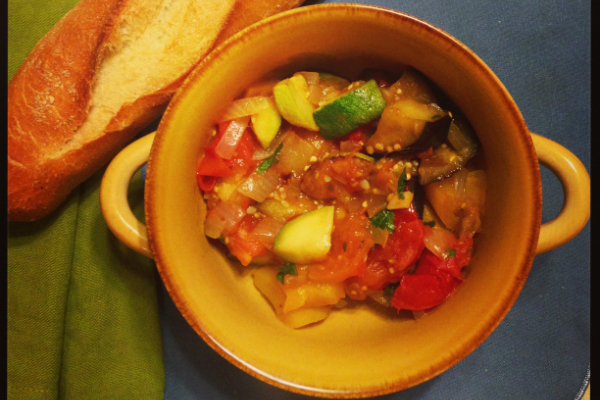 Ratatouille, which comes from the French word “touiller,” meaning “to toss,” is literally a tossing in a pot of summer vegetables and simmering them in olive oil: tomatoes, eggplant, zucchini, bell peppers, onion, and seasoned with fresh garlic, basil, and perhaps a bay leaf. There are many varieties of ratatouille. There is the Disney version, made popular by the Pixar film “Ratatouille”; Julia Child sautées the vegetables separately; Alice Waters creates a “basil bouquet” bound with kitchen twine to enhance the flavors of the vegetables as they cook. When most people hear the words “New England dinner” their first thoughts usually run toward a lobster dinner, a clambake, or an oyster shuck. 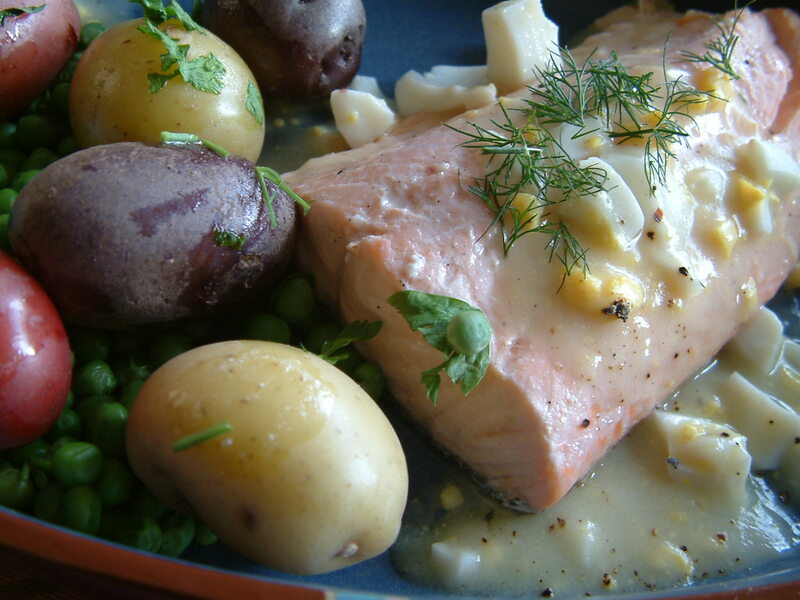 But there is another kind of seafood that has a long association with the Fourth of July, and that is poached salmon with egg sauce. 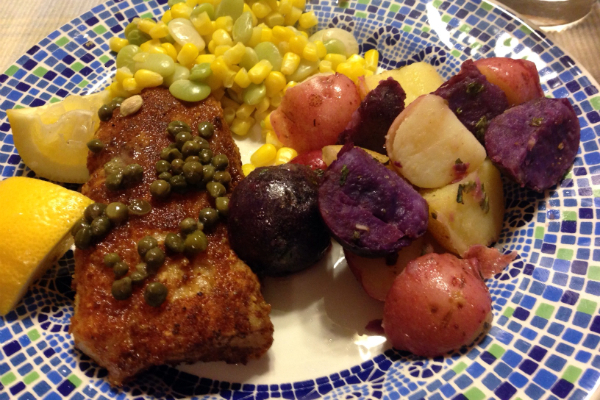 The legend has it that Abigail Adams served Atlantic salmon, fresh garden peas, and new potatoes to John Adams on the first Fourth of July in 1776. And while many New Englanders admit to eating salmon on the Fourth of July, finding strong ties to Abigail Adams remains, well, fishy. Remember Pop Rocks and how fun it was to have a little explosion taking over your tongue? Molecule-R, which makes molecular gastronomy kits for the “amateur chef” to make edible and unusal delights in your own humble kitchen, has packaged popping sugar in 2.8-ounce canisters. 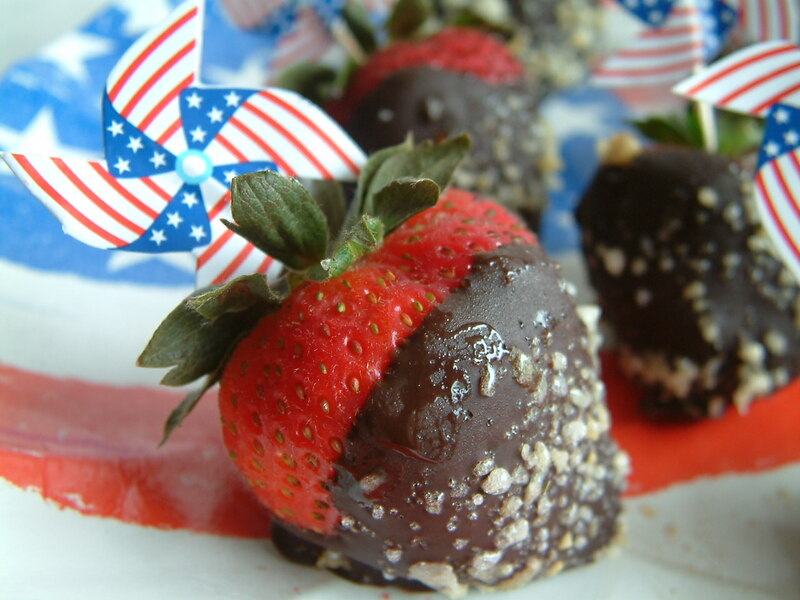 I thought popping sugar would be a great treat for the Fourth of July – fireworks in your mouth! In the webinar I am currently teaching “An American culinary journey: From succotash to urban chickens,” we are spending an entire section on Julia Child. In many ways Julia’s own journey (and I feel like I can be on a first name basis here, since her genius lay in her ability to be accessible and engaging) epitomizes the transition of American cuisine – from one that was recovering from war rations and Jell-O molds into the discovery of cuisine, food as an element able to delight the senses, engage the mind, and empower a cook to exude creativity. Her own awakening, as it is widely known, came in Rouen, France with sole meunière. Forget about buying the same old boring bottles of soda from the supermarket. There is a much better and creative way – with a little bit of effort – to bring a bit of sparkle to your next party. 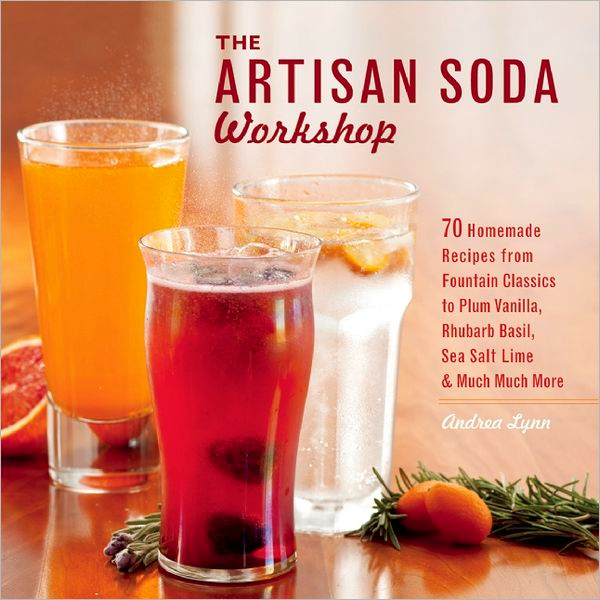 The Artisan Soda Workshop by Andrea Lynn (Ulysses Press, 2012, 127 pp.) has more than 70 recipes that will help you to make your own sodas at home using fresh fruit and the real flavors of spices and herbs. With sections ranging from “Homemade Soda Copycats” (Natural Golden Cola Syrup, Root Beer Syrup), to “Soda Adventures with Herbs and Spices” (Sea Salt-Lime Syrup, Mango-Chile Syrup), to “Seasonal Suds” and “Agua Frescas and Shrubs” there’s a lot here to explore and enjoy. While homemade sodas may seem like a chore, when one could simply twist off the cap of a mass-produced drink, there are some added benefits. Homemade sodas are made with real fruit, not artificial flavoring, and you can control the sugar levels to your preference. The syrups just need to be stirred into seltzer water, and Lynn says purchasing your own seltzermaker is worth it. (She likes www.sodastream.com.) There are also plenty of other uses for your fruit syrup, such as drizzling it over pancakes or atop big bowl of ice cream. We had a Cowboy Chili Cookoff at work this week, and instead of trying to compete among all the other chuck-and-beans creations I decided to go another route and bring homemade soda punch. It was a good decision I think – there were 19 crockpots of chili but only two homemade sodas: Prickly Pear Agua Fresca and Sparkling Watermelon-Jalapeño Agua Fresca. “I’ll have an Arnold Palmer.” Do you know what I mean? Lemonade and ice tea, and somehow my current favorite beverage. Named for the legendary golfer Arnold Palmer, the drink is said to have been born in the 1960s, according to Parade magazine, when Mr. Palmer asked a waitress at a course in Palm Springs to mix lemonade into his iced tea. Another customer overheard his request, and “a Palmer” was born. It’s refreshing powers are said to be the perfect drink to revive onself after 18 holes under the sun. “You can now find it everywhere!” said Palmer, who turns 83 on Sept. 10. 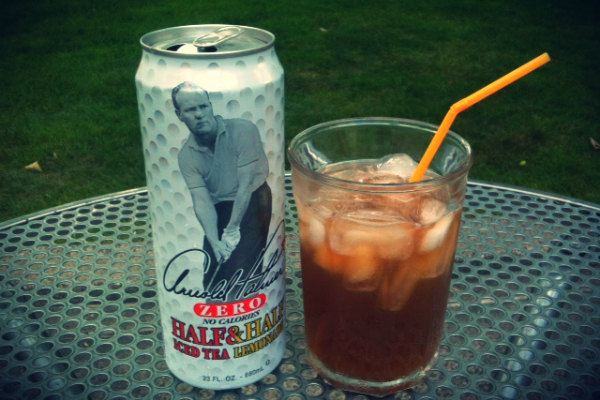 Today, the Arizona Beverage Company has a corner on the market of the half-iced-tea, half-lemonade refreshment coming in bottles of all sizes, including a 20-ounce version bearing not only the image of Arnold Palmer, but a golf ball-shaped neck. Palmer, who stormed on the golfing scene to battle Jack Nicklaus and Gary Player just as TVs became a fixture in every American living room, is said to have been a master of sports marketing. But really, how hard is it to make your own Arnold Palmer at home? Not hard at all! You can either mix up store-bought lemonade and iced tea, or you can make it from scratch. Here are some recipes to help you stir up your own Arnold Palmer. But no promises on improving your swing.